On Grand Teton National Park’s Wildlife Brigade, it’s more about managing people than wildlife. 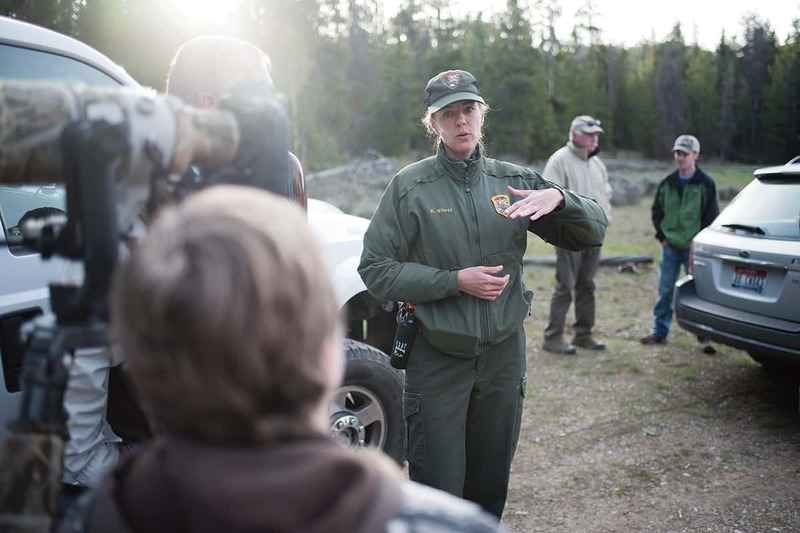 Kate Wilmot, Grand Teton National Park’s bear management specialist, was instrumental in getting the Wildlife Brigade up and running in 2007. The group, comprised of both volunteers and paid staff, responds to wildlife jams and educates visitors throughout the park. THE WILDLIFE BRIGADE started as a pilot program in 2007. 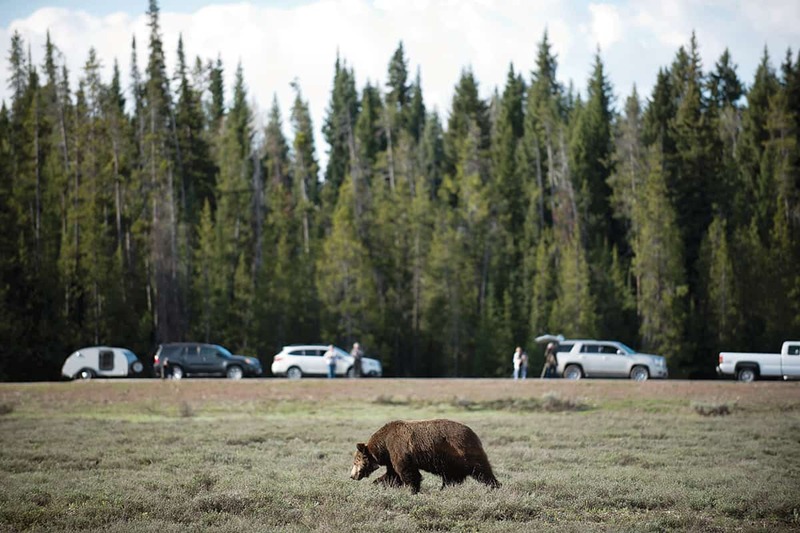 “As grizzly bears started to reoccupy parts of their former range, the park was in a position where it didn’t have the resources to manage bear jams along the road,” says Kate Wilmot, the park’s bear management specialist. Wilmot says the park first realized this in 2004, one year before she arrived. (Previously, Wilmot worked at Glacier and Katmai National Parks, focusing on bears in both places.) 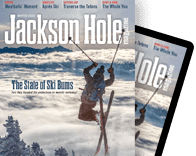 A particularly bear jam-y year was 2006, the first year grizzly 399 raised cubs—three of them—within sight of roads in the Oxbow Bend, Willow Flats, and Jackson Lake Lodge areas of the park. (Grizzly 399 did this again in 2011, and the frenzy was compounded by one of her daughters born in 2006, grizzly 610, also being in the area with two cubs of her own.) In 2006, it was law enforcement rangers who were charged with managing bear jams. But, “Rangers were already overextended,” Wilmot says. It was a tough spring, summer, and fall. “That was when we knew we really had to do something to free rangers up to respond to more pressing calls, like heart attacks and accidents,” she says. In 2007, Wilmot was a seasonal law enforcement ranger in the park and the supervisor of the first two Wildlife Brigade members, Adams and Mohr. Both women were full-time. Adams had been looking for a volunteer opportunity with the NPS. “Kate called and asked if I could be here in two weeks. I said, ‘Yes,’ and I’m still coming up every summer.” Mohr was a seasonal employee working in the park while earning her degree in biology from Metropolitan State University in Denver. Wilmot says the park decided to manage its bears the same way that Yellowstone did: “We’re sharing the same bears, and it’s many of the same visitors in both parks, so it made sense.” Also, data show it works. “It” is managing the crowds watching the bears, rather than the bears themselves. Since its founding, the Wildlife Brigade’s responsibilities have expanded beyond bear jams. “We’ve been called to a hornet’s nest,” Wilmot says. “There are moose jams, elk jams, great gray owl jams, bugling elk jams, fall color jams. There’s always something new.” Mohr says she’s worked grouse jams, fox jams, and pine marten jams. ADAMS SAYS IT is bear jams that are the best part of the job, and the most challenging. “You’re watching the bear, and you’re trying to get cars moving through, and you’re trying to talk to people and maintain distance from the bear.” Also, “Grizzly bear jams are just insane, especially if there are cubs,” Wilmot says. Mohr adds, “Other animals are exciting, but grizzly bears just bring out a different level of enthusiasm in people. It is so exciting for the public to see bears, especially baby bears. When people driving past see people stopped, they slow down and ask why. When I say, ‘It’s a bear,’ they go really nuts. Pulling up, they were totally low-key, but then they hear ‘bear,’ and the doors of their car are flying open and they’re jumping out. 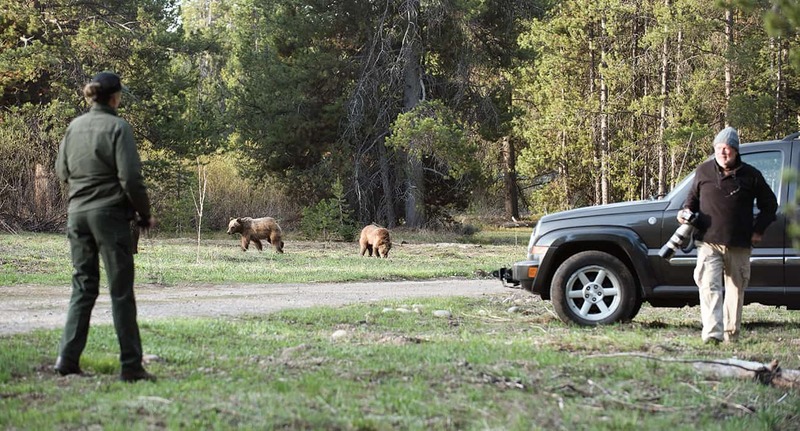 I’m like, ‘I know it’s exciting, but you still have to go and park your car.’ ” While traffic management is secondary to protecting the bears, it is something the Wildlife Brigade does. “We ask people to get all four wheels off the road,” Adams says. Last year was the first year the Wildlife Brigade used orange traffic cones. “I know they’re ugly,” Wilmot says. “But we’ve found them to be helpful, especially on Moose-Wilson Road.” Because the Wildlife Brigade manages the crowds and not the bears, they sometimes erect brackets on a section of road to allow a bear to cross. “We can tell when a bear wants to cross,” Wilmot says. The brackets create a stretch where there is no traffic or people. “It’s successful maybe 50 percent of the time,” Wilmot says. When the Wildlife Brigade does interact with a bear is when it is in a developed area—and only when it’s a black bear. “We never do this with grizzlies,” Mohr says. Even then, though, “We follow the bear where it wants to go,” Adams says. “It is going there for a reason. We just want to help it go a little quicker.” And, “Whenever a bear comes to a road, as soon as it hits the pavement, we want to encourage it to go faster.” Wildlife Brigaders do this by clapping, or with light taps on the horn. “In the String Lake Picnic Area, we try to get ahead of it and tell people a bear is coming through and make sure they have all their bear attractants properly stored,” Adams says. Natural bear behavior—natural wildlife behavior—is what the Wildlife Brigade is trying to preserve. “We want visitors to enjoy watching these animals, but we’re trying not to habituate these bears so they become problem bears. We don’t want bears to think we’re nice,” Wilmot says. 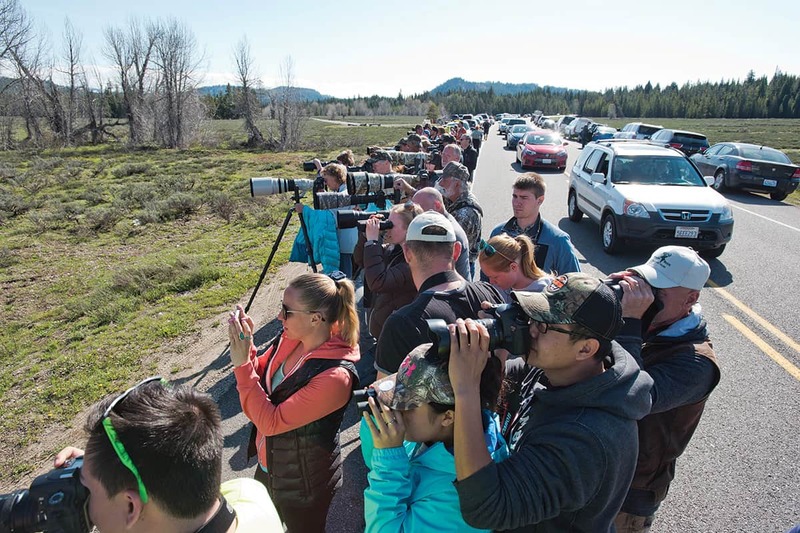 Hundreds of tourists and photographers line the side of the highway last summer in Grand Teton National Park hoping to catch a glimpse of grizzly 610 foraging with her two cubs. The park’s Wildlife Brigade works to manage these situations, which often cause traffic snarls and can sometimes lead to conflicts between wildlife and humans. Visitors and photographers stop to watch a boar grizzly forage near Pilgrim Creek Road last year in GTNP. One of the most difficult parts of a Wildlife Brigader’s job is to ask visitors to move back from wildlife. This isn’t done to prevent people from seeing the animals, but to protect the wildlife, as well as humans. Visitors must maintain a distance of one hundred yards between themselves and an animal.